Hanoi (VNA) – The Ministry of Industry and Trade (MoIT) will directly assess and supervise the development of the 10.6 billion USD Hoa Sen Ca Na steel making complex in the south-central province of Ninh Thuan, an official said. 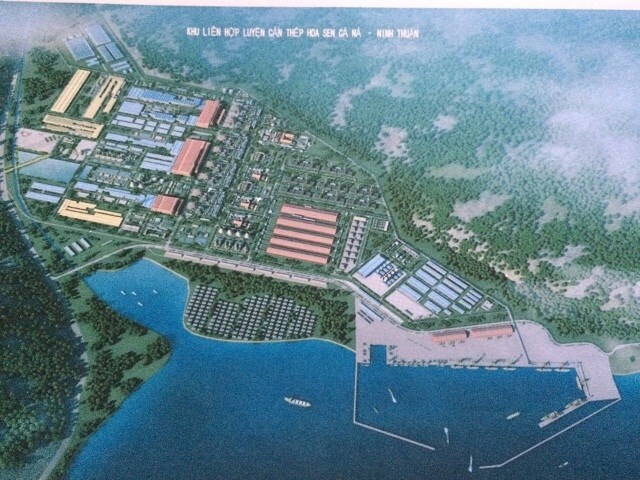 MoIT Heavy Industry Department Director Truong Thanh Hoai made the announcement after the public voiced concerns that the project, which will be built by Hoa Sen Group and produce about 16 million tonnes of products per year, may harm the environment. Vietnamese citizens worried that the project near the sea could bring about damages similar to those caused by Taiwanese steel firm Formosa along the central coast, which resulted in massive fish death earlier this year. The department said Ninh Thuan would have to ask for approval from Prime Minister Nguyen Xuan Phuc before implementing the project, and the Ministry of Planning and Investment would conduct a pre-feasiblity study of the scheme. It is reported late last month that construction of the project was expected to be done in five stages between 2017 and 2031. The first stage would begin operation in 2019, take up an area of 240ha and enable a capacity of 1.5 million tonnes per year. Hoai said environmental issues at steel projects could be easily handled with current technologies. He also stressed the importance of investors conforming to investment regulations and State management agencies closely monitoring projects in their implementation process. It is also necessary that the authorities cooperate more properly, while letting the public take part in project supervision, he said. “Currently, legal documents on the environment and construction and investment are relatively sufficient with tight regulations. We have also learnt many lessons from the case of Formosa as to assessing environmental impacts while operating steel projects," he said. “The Ministry of Natural Resources and Environment will be the main monitor of environmental issues involved in Hoa Sen Ca Na, from basic design to conclusion,” he added. Hoa Sen Group leaders said that the company would try to minimise environmental impacts with various measures, including approaches that save materials and optimise production capacity. Almost 97 percent of Hoa Sen shareholders approved construction of the mammoth steel plant at a meeting held at their extraordinary meeting held earlier this month. The company, based in the Song Than 2 Industrial Zone in southern Binh Duong Province, reportedly represents 40 percent of the steel sheet market and 20 percent of the steel pipe market in Vietnam. It exports products to 65 countries and territories. According to the department, Vietnam has only been able to produce construction-grade steel and imports steel for manufacturing and support industries. The imported volumes amount to some 13 million tonnes every year, and annual trade deficits generated by the steel industry average around 7 billion USD. A national scheme adopted in late 2014 for industry and trade restructuring, with vision looking toward 2030, targets the establishment of steel firms that can produce more than three million tonnes per year and can concentrate on developing products that are still domestically in short supplies. Government directives stated that Vietnam must have large steelmakers to ensure competitiveness and take advantage of iron-ore reserves amounting to billions of tonnes. Vietnam Steel Association Chairman Ho Nghia Dung has said Hoa Sen, alongside other major Vietnamese steel firms such as Hoa Phat and VnSteel, are capable enough to be responsible for large projects.